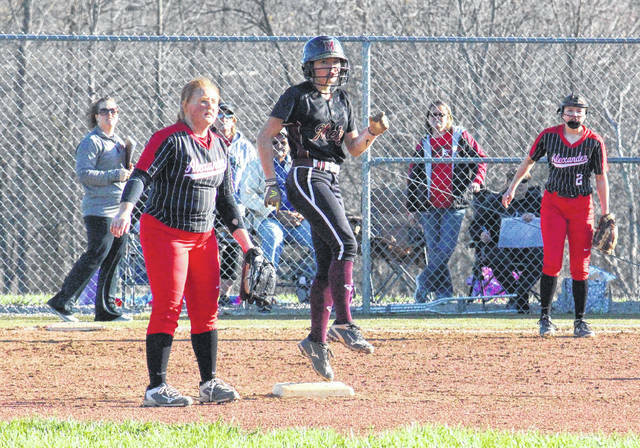 Meigs junior Taylor Swartz (center) pulls into second base for a double, during the Lady Marauders’ 9-1 loss to Alexander on Friday in Rocksprings, Ohio. ROCKSPRINGS, Ohio — The streak has ended. 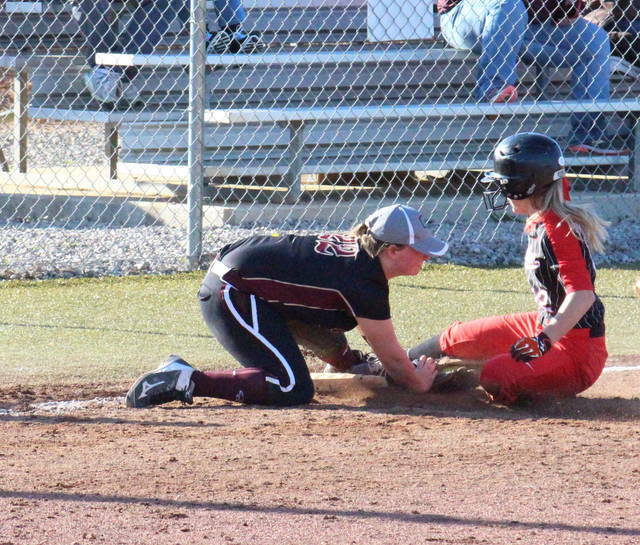 The Meigs softball team’s streak of 18 consecutive Tri-Valley Conference Ohio Division wins halted by Alexander, as the Lady Spartans claimed a 9-1 win on Friday in Meigs County. In the first five innings, Meigs (8-3, 6-1 TVC Ohio) was retired in order in all but the second, in which three Lady Marauders recorded hits but stranded two runners on base. The Lady Spartans took a 1-0 lead after an error in the top of the first inning, and added another run to its advantage with back-to-back one-out hits in the top of the second. A triple by Spurlock followed by a sac-bunt by Hill gave Alexander a 3-0 lead in the top of the third, and the Lady Spartans were retired in order in the next frame. AHS stretched its lead to 6-0 in the top of the fifth, combining three hits with two errors. 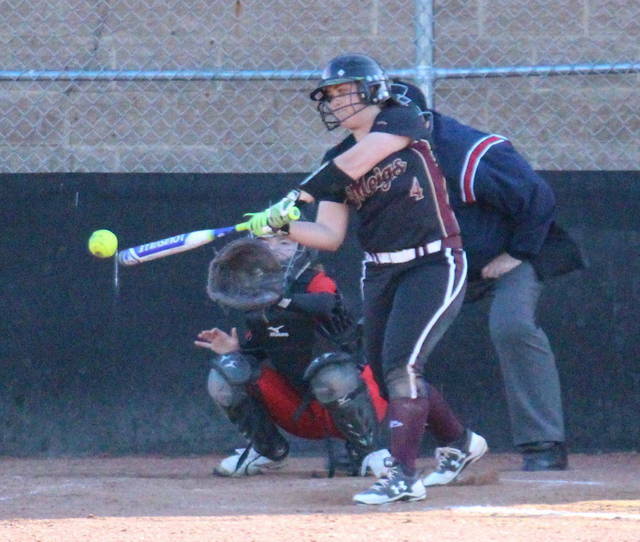 AHS increased its advantage to 9-0 in the top of sixth, which was highlighted by a two-run home run by Mace. The Maroon and Gold finally broke through in the home half of the sixth inning, as Taylor Swartz doubled and then scored on a Peyton Rowe single. Meigs stranded two runners on base in the sixth, and had one hit in the seventh, but fell by a 9-1 final. Breanna Zirkle suffered the pitching loss in a complete game for the Lady Marauders, allowing nine runs, six earned, on 11 hits and a walk, while striking out one. Hill earned the win in a complete game for AHS, striking out four and allowing one earned run on six hits and a walk. Rowe led the MHS offense, going 2-for-3 with a double and an RBI. Jerrica Smith was also 2-for-3, singling twice, while Swartz doubled once and scored once. 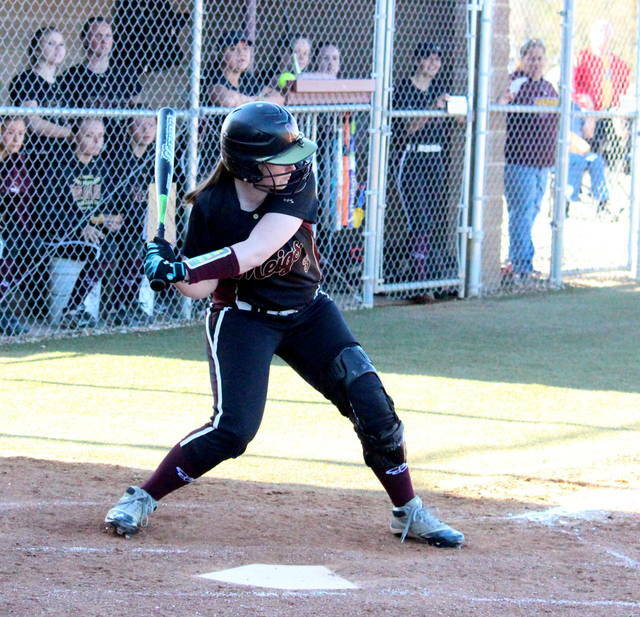 Alyssa Smith also earned a single in the setback. Leading the Lady Spartans, Mace was 2-for-3 with a home run, two runs scored and two RBIs, Ross was 2-for-4 with a triple and two runs scored, while Casto was 2-for-4 with two runs and an RBI. Spurlock tripled once and scored twice for AHS, Miller doubled once and drove in two runs, Hart singled once and scored once, while Cooper and Howard each singled, with Cooper earning an RBI. Meigs committed four errors and left four runners on base, while Alexander played errorless defense and stranded six runners. After hosting Ripley on Saturday, Meigs will get back to work in the league with a trip to Wellston on Monday.